If you haven’t done so already, now would be a good time to sign up for alerts on Alert Rutherford. http://alertrutherford.rcecd911.org. 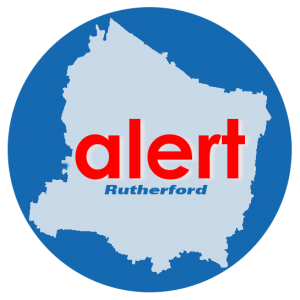 Also, if you are already signed up for alerts on Alert Rutherford, please log into your account and update your contact methods and location information as needed. RCECD Board Of Directors Member and Treasurer John Hood was recently honored at The Heart of Tennessee Chapter of the American Red Cross Annual Heroes Breakfast on March 8, 2017, held at The Grove in Murfreesboro. Mr. Hood has been a member of the District’s Board Of Directors since its inception in 1986. 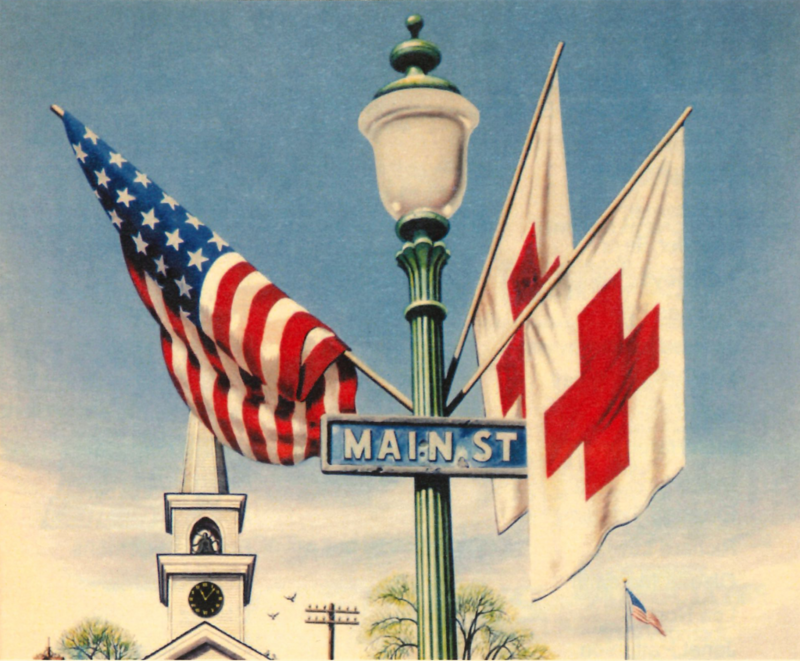 RCECD Board Of Directors Treasurer and Red Cross Hero John D. Hood. John D. Hood was born in Murfreesboro, Tennessee to Emil and Christine Hood. He attended Crichlow Elementary, Central High School and graduated from Middle Tennessee State University in 1954 with an undergraduate degree in social science. While attending MTSU, John worked at a local radio station, WGNS, as a staff announcer. After receiving his undergraduate degree, John spent two years in the Army. After leaving the military, John returned to the area to work as the news and program director for WMTS radio. John also worked for ten years at MTSU as the director of development and then as an assistant to the president. While working at MTSU, John graduated with a master’s degree in education. After leaving MTSU in 1976, John worked in the banking industry for the next twenty years. In 1996, John was elected as a state representative for the 48th District, serving in that capacity for twelve years. In 2008, he returned to MTSU where he is currently the director of government and community affairs. John has served in our community as a past president of the Rutherford County Chamber Of Commerce, a past member and chairman of the Murfreesboro City School Board, a past president of the Tennessee School Boards Association, a former member of the Rutherford County Quarterly Court (now Commission), current member and treasurer of the Rutherford County Emergency Communications District Board Of Directors and a former member and chairman of the Tennessee Advisory Board. 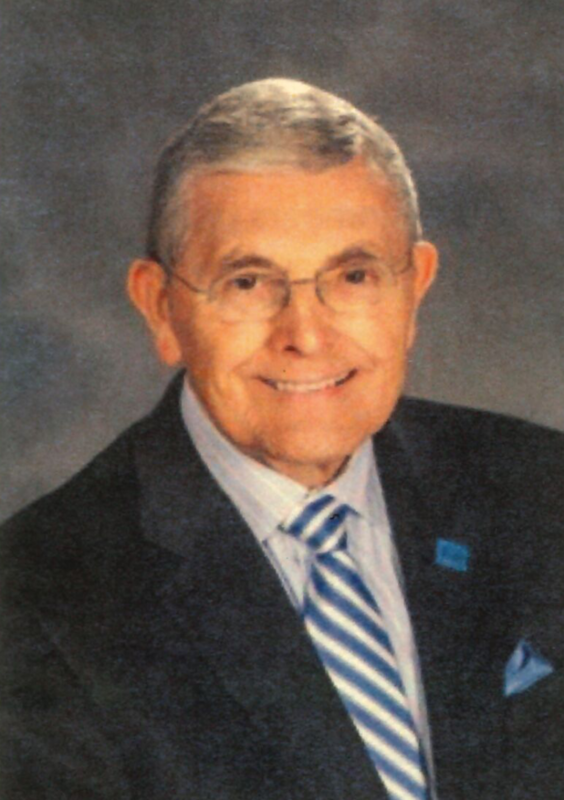 Since 1951, he also served as a charter member of the Exchange Club Of Murfreesboro where he served as president at the club, district and national levels. 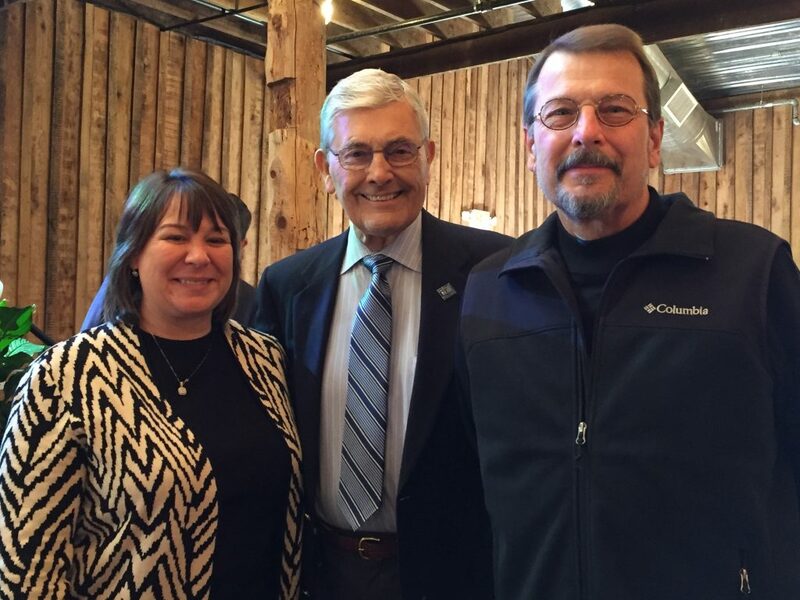 John also served as past president for the National Exchange Club Foundation for Prevention of Child Abuse. John has been honored for his service to the community over the years. In 2010, he was inducted into the Court Of Honor at the National Headquarters. In 2012, he received the Murfreesboro City Schools Foundation Excellence in Education award. John was named the Rutherford County Chamber Of Commerce Business Legend Of The Year for 2013. Recently, in 2016, he was inducted into the Tennessee Journalism Hall Of Fame. John and his wife, Marilyn, were married for over 60 years and have three children, four grandchildren and one great granddaughter. She was chatting online, webcasting live. Nothing unusual about that, except – she said she intended to commit suicide, and she had a gun. Two of them, in fact – two handguns. A telephone call from Texas and the compassion, ingenuity and persistence of Murfreesboro dispatchers, police officers and EMS recently saved a woman’s life, the Murfreesboro City Council learned Thursday night. The entire second-shift team of 911 supervisors and dispatchers at the Police Department’s Communication Center received the city’s prestigious STARS award at council from Mayor Shane McFarland for their compassionate heroism. STARS stands for “Succeeding Through Attitudes Reflecting Service Excellence,” and the Murfreesboro dispatchers certainly had that – if refusing to give up despite repeatedly encountering a frustrating lack of tangible clues adds up to that sort of “can do” attitude. Simply put, they weren’t going to let the suicidal woman kill herself – not if there was any way at all that they could stop her. But it wasn’t easy, according to the description of the incident that Murfreesboro Police Lt. Jimmy W. Puckett filed. The night was May 16. The call came through to Dispatcher Bri Dunn around 8:09 p.m. – from Texas. A Murfreesboro resident was threatening to commit suicide – but the caller only knew her name, approximate age, and “that she was armed with two handguns and staying at a local hotel,” according to Puckett. Which hotel? The caller didn’t know. Dispatcher Michelle Rowland sent patrol units to go look while the communications staff searched the Internet for more clues. Officers arrived at the scene of the only possible address the staff had been able to obtain, but didn’t find the suicidal woman, Puckett continued. Frustratingly, “this also reached a dead end,” according to Puckett – but again, the dispatchers refused to give up. Bingo! At that point, around 8:58 p.m., “Christian began efforts to ping the woman’s phone,” Puckett described, giving the 911 team her approximate location. From there it became a matter of responding to the known scene – at long last. Rowland dispatched EMS as well, at that point, as officers located the suicidal woman. Plus, they were recognized as STARS. Even better, a local woman is still alive. Telecommunicators of the Year are from left, Benjamin Hunt of MTSU Police, Amber Bryant and Cris Kamka of LaVergne Police, Reasa Thibodeaux of Smyrna Police, Michelle Corum of the Sheriff’s Office and Rutherford Fire and Rescue and Brandy Sweeney of Murfreesboro Police and Murfreesboro Fire and Rescue. Not shown is Penny Barrett of the Emergency Medical Services and Andrea White, Kenneth Criswell, Candace Elmore, Jamie Harrell, Dalivus Morgan and Priscilla West of La Vergne Police (Photo courtesy of WGNS). MURFREESBORO, TN – Since being officially designated by Congress in 1991, public safety agencies across the country have recognized the instrumental role played by telecommunicators during National Public Safety Telecommunicators Week. Telecommunicators are the dedicated professionals who answer 9-1-1 calls, process requests for service, and utilize technical skills to provide communications support to law enforcement, fire and rescue departments, and emergency medical services. The second week of April is dedicated to these “first first responders” who serve as public safety telecommunicators. 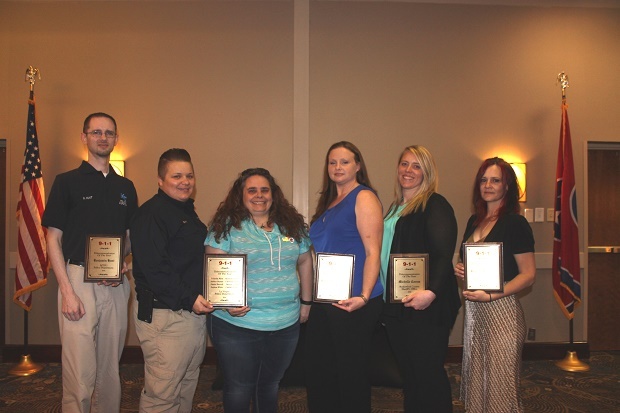 The Rutherford County Emergency Communications District (RCECD) held an awards luncheon on Friday, April 15th at the DoubleTree Hotel to honor six telecommunicators who were recognized by their respective public safety agencies for exemplary service. Mike Walker, LaVergne Chief of Police was the guest speaker & Jeff Davidson, Deputy to the Mayor presented the awards. 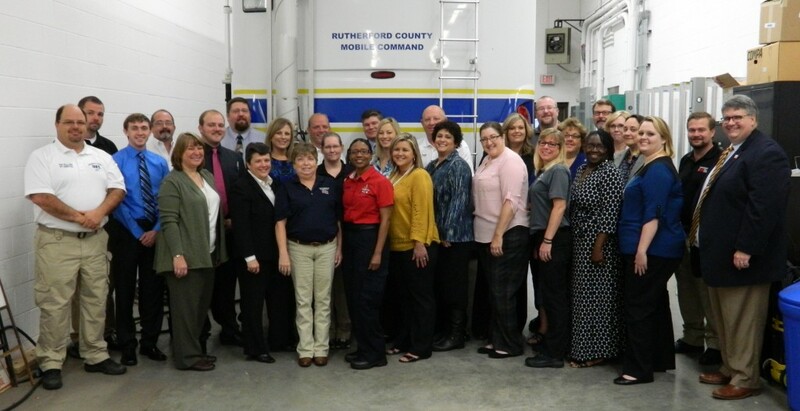 “It has been a long standing tradition that the Rutherford County Emergency Communications District Board of Directors has dedicated time each year to honor the outstanding men and women who answer the public’s calls to 911 seeking help”, said Steve Smith, RCECD Director. The 2016 recipients of the Telecommunicator Awards are Michelle Corum of the Rutherford County Sheriff’s Department, Brandy Sweeney of the Murfreesboro Police Department, Reasa Thibodeaux of the Smyrna Police Department, Emergency Services Communications Division staff Andrea White, Amber Bryant, Kenneth Criswell, Candace Elmore, Jamie Harrell, Christine Kamka, Dalivus Morgan and Priscilla West of the LaVergne Police Department, Benjamin Hunt of the MTSU Police Department, and Penny Barrett of the Rutherford County Emergency Medical Service. “The Rutherford County Emergency Communications District continues to ensure that our 911 public safety answering points are provided the most current 911 technologies available. The benefits of such technologies however, would not be fully realized without the dedicated service of those individuals recognized by their departments this week”, said Smith. Telecommunicator Zach Kirsch shows 1st grade students at Barfield Elementary School how to use 911 through a coloring sheet (Photo from WGNS). Murfreesboro (WGNS) – If Fluffy the cat climbs up a tree, should a child call 911, asked Rutherford County Sheriff’s telecommunicator Zach Kirsch. “No,” shouted a chorus of enthusiastic 1st grade students at Barfield Elementary School. “When Fluffy gets hungry, she’ll come down for tuna,” Kirsch joked as the children laughed. If a child is injured when an adult isn’t home, should a child call 911? Kirsch asked. “Yes,” the students replied. The questions and answers were part of a new program for kindergarten through 3rd grade students Kirsch and fellow telecommunicator Raymond Shew developed to teach children how, why and when to call 911. They will work with the school resource officers to teach the program in every county school. Kirsch presented the first program last week in 1st grade classes taught by Natalie Russell, Heather McKee and Robin Saupe. Principal Judy Goodwin joined in by demonstrating how to call 911 on the classroom phone. Barfield School Resource Officer Ward Bates coordinated with Goodwin and the teachers for Kirsch to teach 18 classes during the first day of the program last week. They distributed coloring sheets to place on home refrigerators, pencils and flyers to reinforce the message. Kirsch reminded the students that if they dialed 911 by accident, they should stay on the line so the telecommunicator can make sure there is not an emergency. Otherwise, a deputy will be sent to the home to check for an emergency. He asked 1st grade students if they knew their address so that emergency responders could reach them quickly during an emergency. “If you don’t know, go home and ask your mom,” Kirsch said. Kirsch explained he should tell an adult. But if an adult isn’t available, he should call 911. Both Shew and Kirsch have answered numerous 911 calls from children who don’t know what to say. They hope the program will allow children to remember when to call 911, what an emergency is and what their location is. By using scenarios, they hope the children will remember their message. RCECD was honored to host the National Emergency Number Association‘s Center Manager Certification Program in late September. Presented by NENA in cooperation with the Tennessee Emergency Communications Board (TECB), NENA’s Center Manager Certification Program (CMCP) is designed to equip current, new, and potential PSAP and 9-1-1 Authority managers and supervisors with the tools needed to effectively manage their agency through a rigorous 40-hour course of lecture and lab-based education. The program serves as an affordable career advancement opportunity to anyone involved in public safety agency management, and provides education in subject areas that are critically important to anyone looking to forge a long and successful career path. This session had attendees from ECDs across Tennessee and out of state. WALTER HILL, Tenn. (AP) — A Middle Tennessee teen is alive, thanks to Siri. Eighteen-year-old Sam Ray says the voice recognition service on his iPhone — famously named Siri — called emergency dispatchers after his truck fell on him while he tried to make repairs. Ray told media outlets that a jack collapsed, pinning him under nearly 5,000 pounds of metal in a location where he couldn’t be easily seen or heard. He says he was trying to get free when he heard Siri activate. “I said ‘Call 911,’ and that was all it said,” he said. She said she knew his general location from the cellphone signal, but Ray helped them pinpoint his exact whereabouts. When volunteer firefighters arrived, they raised the truck back up with a jack and pulled Ray out. He was under the truck for about 40 minutes. Ray and Lee met Friday for the first time after the July 2 incident. Rick Miller, who is chief of trauma and surgical care at Vanderbilt University Medical Center, said Ray suffered broken ribs, a bruised kidney, cuts and a concussion, and he had burns on one arm. Miller said Ray is lucky his wounds weren’t worse. Since being officially designated by Congress in 1991, public safety agencies across the country have recognized the instrumental role played by telecommunicators during National Public Safety Telecommunicators Week. Telecommunicators are the dedicated professionals who answer 9-1-1 calls, process requests for service, and utilize technical skills to provide communications support to law enforcement, fire and rescue departments, and emergency medical services. The second week of April is dedicated to these “first first responders” who serve as public safety telecommunicators. The Rutherford County Emergency Communications District (RCECD) held an awards program on Friday, April 17th at the Embassy Suites Hotel & Conference Center to honor six telecommunicators who were recognized by their respective public safety agencies for exemplary service. Curtis Sutton, Executive Director of the Tennessee Emergency Communications Board (TECB) was the guest speaker. The 2015 recipients of the Telecommunicator Awards are Riley Stone of the Rutherford County Sheriff’s Department, Lindsay Callahan of the Murfreesboro Police Department, Reasa Thibodeaux of the Smyrna Police Department, Jeremy Adcock of the LaVergne Police Department, Trevor Cheney of the MTSU Police Department, and Cher Flett of the Rutherford County Emergency Medical Service. From R: Riley Stone of the Rutherford County Sheriff’s Department, Lindsay Callahan of the Murfreesboro Police Department, Reasa Thibodeaux of the Smyrna Police Department, Supvervisor Andrea White, accepting the award for Jeremy Adcock of the LaVergne Police Department, Cher Flett of the Rutherford County Emergency Medical Service and Trevor Cheney of the MTSU Police Department.